According to the world's most reliable source for holiday information, Twitter, today happens to be National Dessert Day. I don't know how else to celebrate this national holiday besides eating at least one tempting treat and then incorporating that same guilt into a delicious mani. For inspiration, I turned to my ever-growing pile hill mountain of unreviewed products, and my eyes fell on the Tammy Taylor products. Right away, the pot of loose glitter called Twirl 'a' Whirl caught my eye. 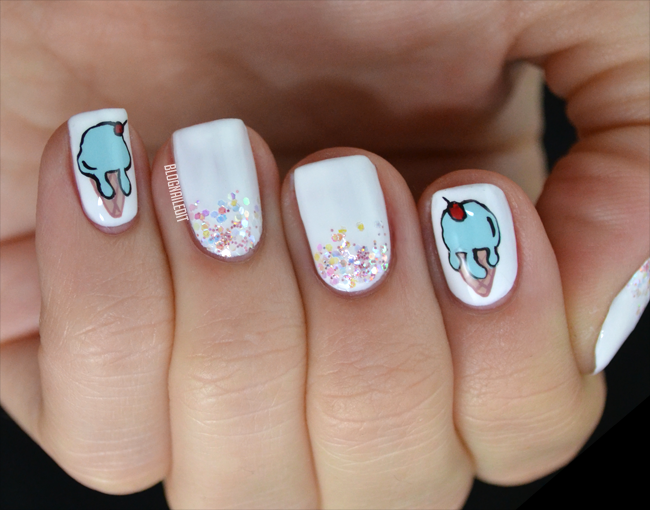 Its irridescent flakes reminded me of sugar, so I started that as a design for nails, and then went absolutely crazy with some freehand ice cream cones. A freezer full of frozen chicken at freezer-burned berries just doesn't nail the sweet tooth craving like ice cream, so I'll stick to celebrating the holiday on my nails only. Tammy Taylor products are probably some that untrained nail techs haven't heard of. I definitely hadn't before starting school, but now that I have, I realize that the company is a standard brand in nail technology. The products are excellent from what I've experienced! The first color I'm showing tonight is the blue from ice cream, Mermaid. I used 2 coats for this swatch, but almost got away with just one. 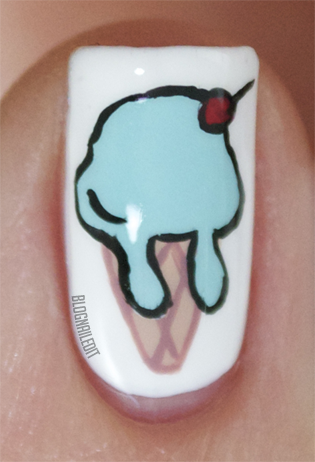 The powder blue creme is great for nail art! Cappuccino was also used in the ice cream nail art, to add the waffle lines to the cone. (Waffles sound unbelievably delicious right now.) This also used 2 coats, and is a reddish-tan color terrible for my skin tone. It doesn't mean it's a terrible color though! Coral Sunset also used two coats. (In fact, all the polishes I'm showing required only two coats for the correct opacity. Two coats is the standard.) This reddy coral is more red than the polish I'm showing next, and appears brighter in real life than I've captured here. Over the Top, while close to Coral Sunset, has more pink. It's not neon, but it's definitely a hot pink! Two coats again. Gettin' My Mauve On is a mauve color straight out of a 50s living room. It's redder than Cappuccino, and I think my swatch did a good job of capturing that. The bottles are harder to tell apart than the swatches. Again...2 coats. Mango Tango is a rich addition to my collection! It's a crelly (creme-jelly), so its texture is different than the others, but even with just 2 coats (shown), it covers perfectly. It's a hot orange-red, though it looks just red in the swatch. This was the cherry on my cones. Finally we have Thrill Ride. Though it dries somewhat sation-matte, a layer of top coat shines it up nicely, to make it the exact color of a Crayola marker. It pops, and I love the color on my nails. As usual, this was two coats. Not being shown today, but coming highly recommended by me is the Tammy Taylor peach cuticle oil. Son of a PEACH that stuff smells good! My love affair with the almond cuticle oil from CND is still strong, but this peach goodness is gaining traction faster than ice melting on a stove. It's absolutely amazing, and a nice, bright, tangy change from the sweet, nutty aroma almond oil has. Tammy Taylor products are available online at their website. The polishes are $6.95 each. I like the ease of application of the polishes and, as mentioned, I'm obsessed with the cuticle oil. I'd recommend trying these products out. Additionally, I've heard great things from my instructor about Tammy Taylor's other products, including her acrylics. I've spent some time online looking through sites relating, and found an awesome, informative channel where Tammy Taylor's techniques are shown. I've referenced them plenty since finding them! These products were sent to me by Tammy Taylor. The reviews are based entirely on my experience with the products and were in no way influenced by anyone. Cute design! the brand is new to me, but the polishes look as if they're good quality! Wow! Must be flattering that Tammy Taylor send you her products!! :) Love the colours! Gettin' My Mauve On is just gorgeous!!! And love your nail art! oh my gosh, I love Tammy Taylor acrylic and her glitters! I have her buffed pink acrylic on right now. She definitely has the best acrylic, in my opinion. I haven't tried any of her polishes but am loving Mango Tango & Coral Sunset. 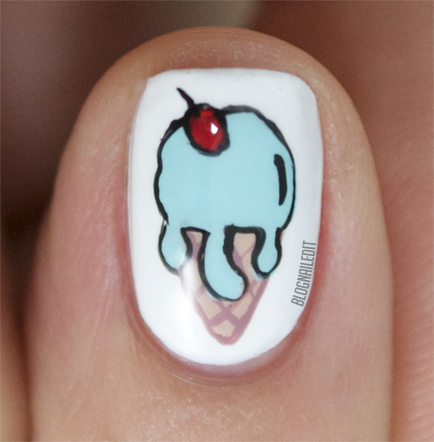 Great job on the ice cream cone nail art! Looks yummy enough to eat! OMG i just love them, sooo cute!! Where can i buy that glitter polish? I love these colors! And $6.95 is not bad at all! These are absolutely adorable! Love the design!